Highly efficient end loading 1/2 Wave vertical covers bands: 40, 30, 20, 17, 15, 12, 10, 6 and 2 Meters. Requires no radials, no lossy traps. Only 20 feet high and has a very manageable 7-foot footprint so you can easily mount it in a small area or patio. MFJ-1799X is low profile so it can blend in with trees and the sky. 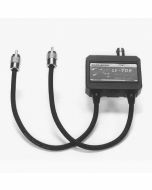 High power air-wound choke balun eliminates feedline radiation. MFJ-1799X features automatic bandswitching, a low radiation angle, omni-directional and handles 1500W PEP. Built-to-last. Incredibly strong solid fiberglass rod and large diameter 6063 T-6 aircraft strength aluminum tubing are in the main structure. Efficient high-Q coils are wound on tough low loss fiberglass forms with Teflon wire.